Cities have long been seen as places serving a variety of purposes. In 1933, for example, the architect Le Corbusier detailed four essential roles of a functional city. A working city is one that provides dwelling, work, recreation, and circulation to its people. Throughout the 20th century, trends in city building were to separate these functions into differing spaces. There were areas meant for living (the suburbs), areas meant for working (the central business district), and areas meant for playing (the entertainment district). More recently, the trend has been to move away from the division of city life toward a unification of day-to-day activities via “mixed use” development. Here, neighborhoods are designed to be places of living, working, and entertaining simultaneously. The shorthand for this approach has been termed “live, work, play” by planners, developers, and policymakers alike. 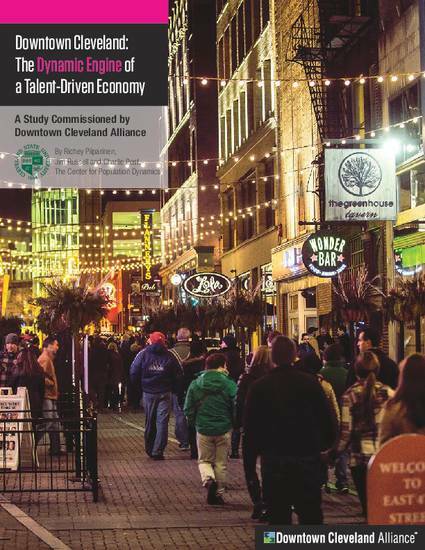 No other neighborhood in Greater Cleveland has redeveloped as quickly and noticeably around the “live, work, play” model as Downtown Cleveland. The following details this shift, with the intent to not only discuss what these changes mean for the future of Downtown, but what Downtown Cleveland’s evolution means for the region as a whole.